When I began the arduous college search my junior year of high school, I prioritized two things: a city environment and diversity. I’m from a very small, rural town in northern New Jersey, and I was one of about five black kids in my graduating class of 248 students. Diversity was not something I was exposed to growing up, so I was more than ready for college to drastically change that. I made it a goal to attend a city school, largely because of internship opportunities, but also because of the assumption that any university with a large student population in an urban setting would have every ethnicity and culture imaginable. 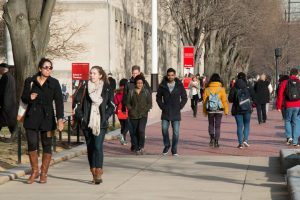 As I walked down Commonwealth Avenue on the first week of school, I began to realize that diversity at Boston University was not exactly what I expected. Boston University’s reported numbers on diversity in our student body are not always seen on Commonwealth Avenue. PHOTO BY KYRA LOUIE/ DFP FILE PHOTO. racial diversity I sought wasn’t about numbers — it was about interactions among people of different backgrounds. I guess I inadvertently pictured racial distribution as a subset of this expectation. For the first few weeks of school, I based my judgement of BU’s diversity purely on what I saw around campus, and I honestly didn’t see a lot of color. The fact that I didn’t see as much blatant racial diversity as I hoped for was a bit disheartening at first. How was I supposed to make friends with experiences similar to my own? Was I going to feel isolated and ostracized by ignorant comments and judgmental stares? Would college be high school all over again? All of these thoughts raced through my head as I noticed how some racial groups clearly overshadowed others. But once I started joining clubs and getting to know different people all over campus, I realized that although racial diversity may not be as present as I’d hoped for, the multitude of cultural experiences that encompass BU more than make up for it. I’ve met people who have lived in Germany, Venezuela, Hong Kong, Haiti and all across the United States. I’ve met people with unique family backgrounds and histories. Meeting these people made me realize that a lack of racial diversity doesn’t necessarily mean a lack of worldliness or variety. College has exposed me to people of all different upbringings, regardless of their color. Consequently, I’ve also met people at BU who I can relate to and identify with. All in all, my experience has shown me that while racial diversity is important, a diversity in culture and experiences are what bring people together.